If your account is enabled for video calls, you can make face-to-face video calls with your contacts. All you need is a camera and your computer’s speakers and microphone. You can also use a headset if your computer doesn’t have a built-in audio device. Point to the contact’s picture, and click the Video icon. A toast alert pops up on your contact’s screen, which they can use to accept or ignore your request. 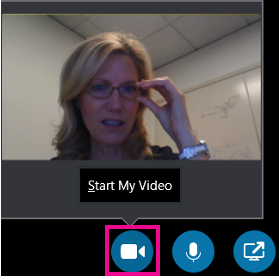 If the video call is accepted, the conversation window expands to display the video. Use the views and controls, such as mute/unmute, as needed. For details about controls and views, see the following section. To end the call, close the window, or click the hang up button. To stop showing your video, point to the camera icon, and click End Video. The audio will continue. You can also add video to an existing instant messaging (IM) conversation. Simply click the camera icon in the window to start your video. Gallery View to show all of the participants’ videos (if you have more than two people). Speaker View to show the presenter’s video or photo at the lower-right corner of the meeting window, plus meeting content. Content View to show only the meeting content. Compact view to show the tiles of the participants’ photos in a compact window. Mute, Unmute, or Remove to mute, unmute, or remove that person from the call. Lock the Video Spotlight to turn off video/photo of everyone other than the person who is talking. Full Screen View, for a large view of the videos or photos. Pop in people region to go back to normal view. To answer the call, click anywhere on the picture area. To reject the call, click Ignore.